Reverse osmosis is a water purification method that uses a membrane filtration technology that works by forcing water under pressure through the very tiny pores of a semi-permeable membrane. Combined with carbon, sediment and mechanical filtration to produce highly purified, great-tasting water. Well Water, Lake Water and Sand Point Water Sources tend to have more abnormalities as they may not be treated by the municpality and the water condition is up to the discretion of the individual. Water sources can contain various amounts of iron, nitrates, magnesium, mercury, arsenic and other potentially dangerous chemicals. Reverse Osmosis systems can filter out these harfmul elements and make your water safer to drink! Individuals obtaining their water from the town or city do not have to worry too much about bacteria and abnormalities in their water because the water is treated at water purification plants. However, municipalities tend to be more focused on treating the water for bacteria and tend to over-treat the water in a way that uses too many chemicals. Chlorine is a major factor in municpal water along with fluoride. Some municipalities are going as far as putting amonia into the water. These chemicals do a great job at treating and preventing bacteria, but what kind of effect do they have on our bodies? Water, driven by normal city water pressure, flows first through a carbon pre-filter, which removes organic contaminants including chlorine and its by-products. Next, it enters the reverse osmosis membrane, a very tight, sheet-like filter, that allows water to pass but rejects dissolved solids like sodium and impurities like lead and arsenic. Some of the water entering the unit is used to cleanse the membrane surface and flows to the drain pipes. The purified water is stored in a small storage tank until it is needed. When the faucet mounted on the sink is opened, the purified water is forced by air pressure through another carbon filter, which gives it a final filtration and from there to the faucet. (This is a simplified description of a three-stage RO unit). Distillers typically remove a few parts per million more of common mineral constituents like sodium. However, distillers don’t do a good job with volatile chemicals with a low boiling point. Chloramines, for example, which many cities now use instead of chlorine as a disinfectant, aren't removed well by distillers. Reverse osmosis, with the carbon filters that accompany it, does a very good job with chloramines. Unless volatile chemicals like chlorine are removed by carbon filtration before they enter the distiller, they will be released into the room air or they will end up in the distilled water. But in general, distilled water is very pure, as is reverse osmosis water. Doesn't Reverse Osmosis Water Strip Essential Nutrients From the Water? Reverse Osmosis water contains under 10ppm so the short answer is yes. With that being said, Most people get enough of these essential nutrients from their daily meals so the difference is marginal. However, we do have an option for those who wish to add these nutrients back into their water. Aquapura offers a simple remineralization filter that can attatch to almost any Reverse Osmosis system! 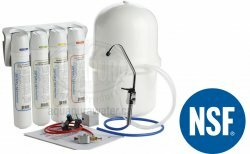 How much does it cost to service a reverse osmosis unit ? 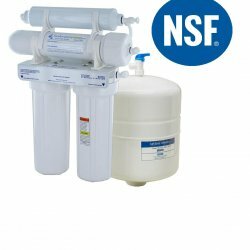 Starting as low as $15.99 per year, a standard two-stage reverse osmosis filter system can last up to 12 months depending on water consumption and condition. Reverse osmosis membranes are guaranteed for one year, although they commonly last up to five. The price of a standard membrane starts at just $29.99. What kind of Reverse Osmosis Systems do you carry? Aquapura Water Products sells only the best quality systems. We have various Reverse Osmosis systems available to meet various needs. The Pentek 4 Stage NSF Certified Reverse Osmosis System is our best selling Reverse Osmosis System. The Pentek NSF R.O unit is a high quality system without the high price tag. Being easy to install and packaged with a user friendly manual make this R.O system a favourite amongst costumers and contractors alike! Give us a call or email for more info!!! 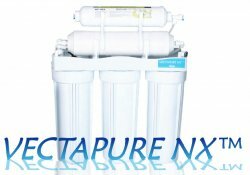 The Vectapure (Waterite) NSF 58 Certified Quick Change RO features quick-change cartridges, which provide a simple alternative to traditional reverse osmosis systems. This simple twist off and twist on design allows for easier filter replacements and can save you time and money. These proprietary cartridges also simplify the regular replacement as required – typically on a semi annual basis. The Vectapure NX 5-Stage 75GPD Reverse Osmosis System is the most economical solution for those who use want a bigger storage tank and more gallons per day of R.O water. This R.O system is capable of producing up to 75 gallons per day and comes with a bigger 3.2 gallon storage tank. As a bonus, this unit also comes with a Leak Stop Safety Flow Interuptor! This safeguard can prevent leaks by cutting off the R.O water supply when a leak is detected.